Let’s admit it. Sometimes, being a stay-at-home mom can be a little bit boring. Every day is the same thing, over and over and over. It’s good in that you have a comfortable routine, everything is going well, not much to worry about… but yet, it’s just… boring. My daughter inspired a little bit of a change in me recently. Nothing big, but a slight little personal change to shake things up a bit. What was that change? Pink hair! My favorite color is pink, so it was obvious I’d choose this color. It was a fun little change that was just what I needed to put a spring in my step, a smile on my face and it gave me a boost in confidence (not that there wasn’t any of that before, but it’s just bigger and better now!). 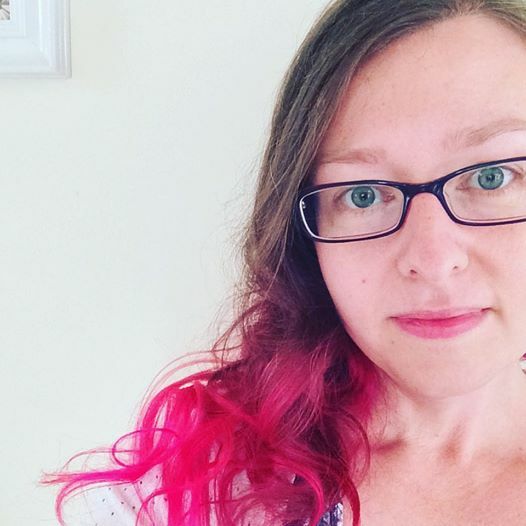 So now I’ve been walking around saying, “Pink hair, don’t care!”. The only downside is that I can’t get my hair as smooth and shiny as it was when I left the salon! Hah! My pink hair gave me something new and fun to look at in my daily routine, and I’ve been trying to think of a way to tie this into the recipe I’m going to post today. Apple pies. They’re lovely, right? There’s nothing on Earth that can beat a fresh-out-of-the-oven apple pie. But what if we threw something else into an apple pie to give it a little flavor boost (like how the bright pink gave me a happiness boost)? Many flavors go well with apples, but I decided to go with another fruit – blackberries. Hence, my latest creation, blappleberry hand pies! If you’ve been following me on Instagram, you’ve seen that we’re on a hand pie diet this month. 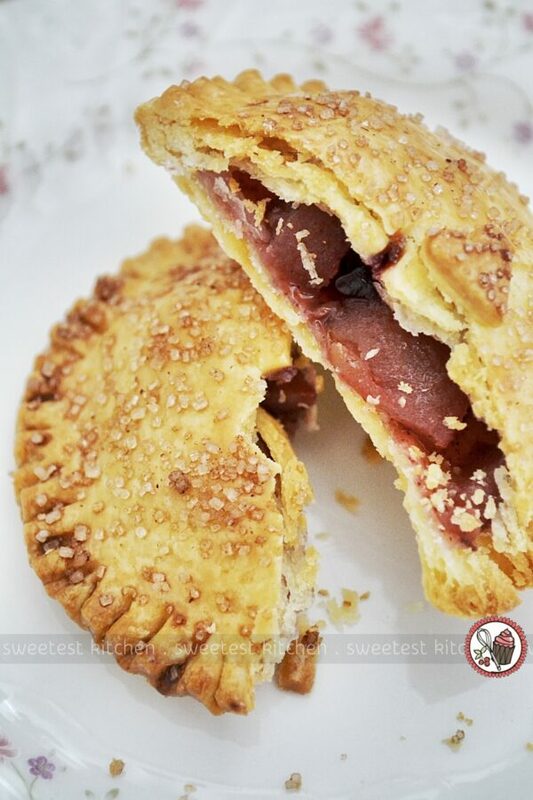 Other than two batches of blappleberry hand pies, we’ve made apple hand pies and cherry hand pies; blappleberry has been, by far, our favorite. And just today I made a batch of blueberry hand pies and strawberry hand pies. Today, I’m going to tell you how to make these really easy pies. I have opted to keep things a little quicker and use store-bought shortcrust pastry, but feel free to use a homemade pastry recipe if you prefer. To get started, make the blappleberry filling. This is easily made by mixing together chopped Granny Smith apples, chopped frozen blackberries, raw sugar, glacé ginger, cinnamon and flour. Unfortunately, the most time-consuming part of this recipe is chopping the apples and blackberries, but you’ve got to cut them up small so you can get a good amount of filling inside the pies, and also so that they’ll cook through. Set the filling mixture aside to macerate and become juicy. 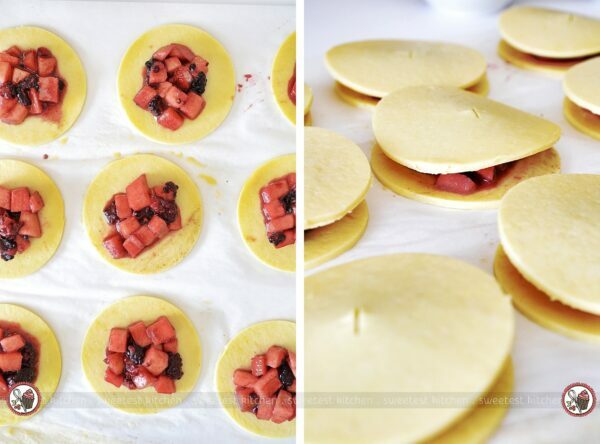 Meanwhile, thaw out some pastry sheets. Have at the ready an 8cm pastry cutter (or any size you prefer), a fork to crimp the edges of the pies, a cup with eggwash (1 egg whisked with 1 tablespoon water) and a pastry brush (and if you really wanted to prepare ahead of time, may as well set out some chunky sugar mixed with a sprinkle of cinnamon, which will be for sprinkling the tops of the pies). When the pastry has thawed, start cutting out rounds with the pastry cutter. On half of the rounds, brush on a light coating of eggwash. With the other half of the rounds, cut a small cross-shape in the center of each one. Place about 1 tablespoon of the filling, along with a little bit of the juices, onto the center of each eggwash-coated round. Cover the filling with one of one rounds that you cut the cross-shape into and crimp around the outsides edges with a fork. 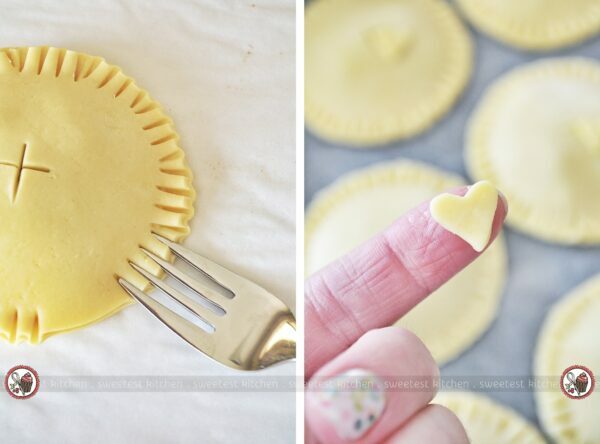 If you like, use a tiny cookie cutter to cut out a heart (or any shape you like) from the spare pastry to use for decoration on top of the pies. Once the edges are crimped, place the pies onto a baking paper-lined baking tray. 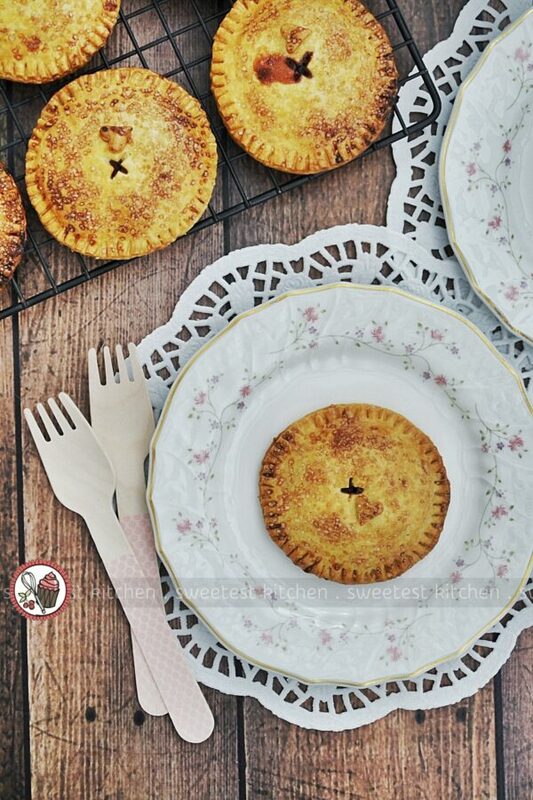 If you’ve decided to use a small heart, or other shape, for decoration, brush the back of the shapes lightly with the eggwash and stick it onto the top of the pies. Place the tray of pies into the refrigerator for 15-30 minutes to chill. Meanwhile, preheat the oven to 200C. Remove the pies from the refrigerator and brush the tops lightly with the remaining eggwash. Sprinkle over the cinnamon-sugar mixture and pop the tray into the oven for 15-20 minutes, rotating the tray once during baking (especially if your oven has hot spots) to brown evenly. Cool those pies on a wire rack and then enjoy immediately for the best texture and flavor. 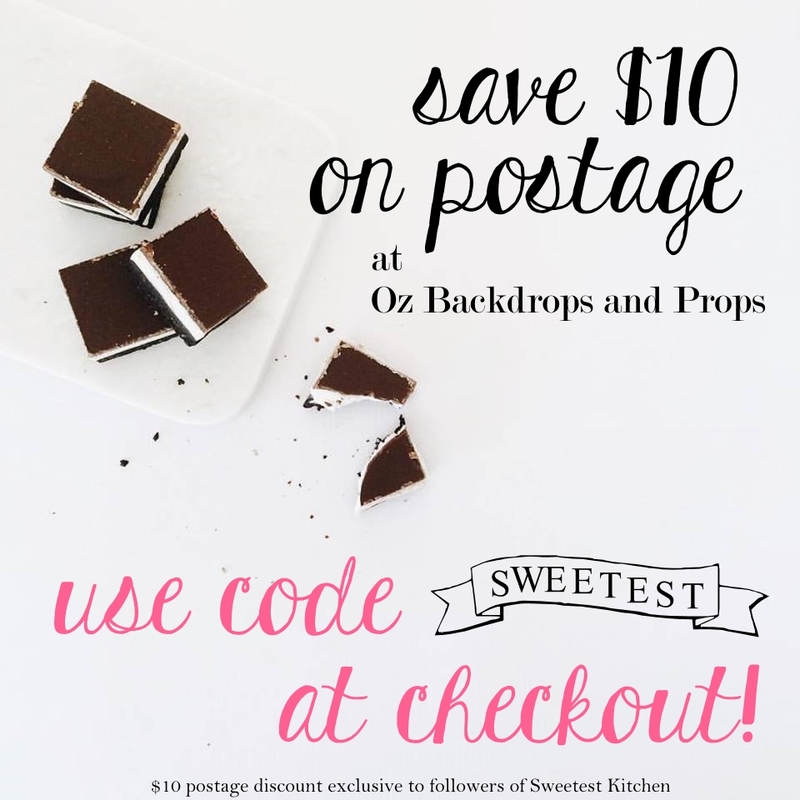 If you love pie crusts, by the way, you’re going to love these! You can store them in the refrigerator for 3-4 days, or at room temperature for about 24 hours. 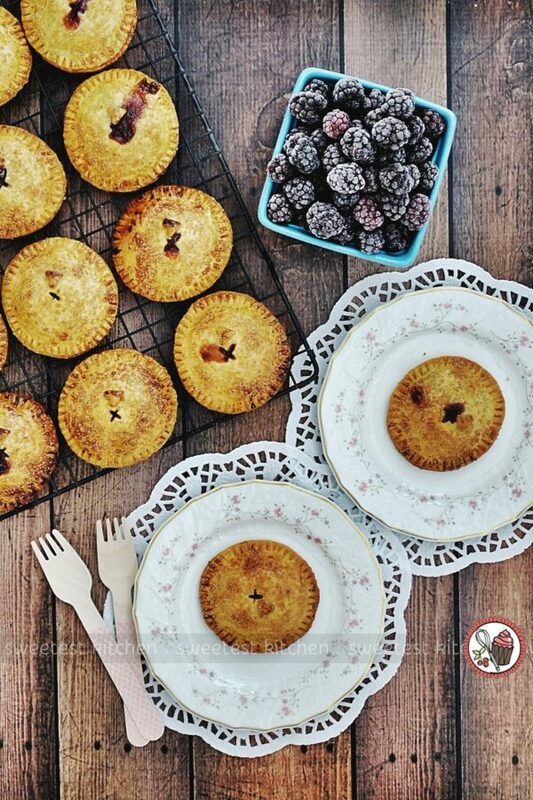 How adorable are these tiny pies! The blackberries and apples taste amazing together, and there’s a tiny hit of spicy ginger in every other bite – just what the apples needed to shake things up! So lovely! We just love hand pies, not only because they’re yummy, but also so versatile. You can fill these pies with anything at all, really. I have some plans for future hand pies that involve caramel apples, and even s’mores! 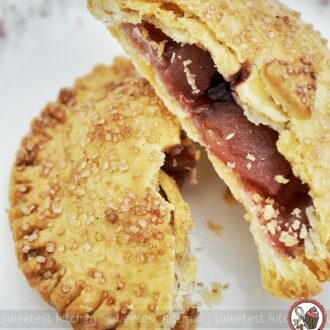 Blappleberry hand pies are so perfect for a quick morning tea snack, or for school lunches. They’re fun to make with the kids, as well, so get them in the kitchen with you today and crank out some of these deliciously cute hand pies! 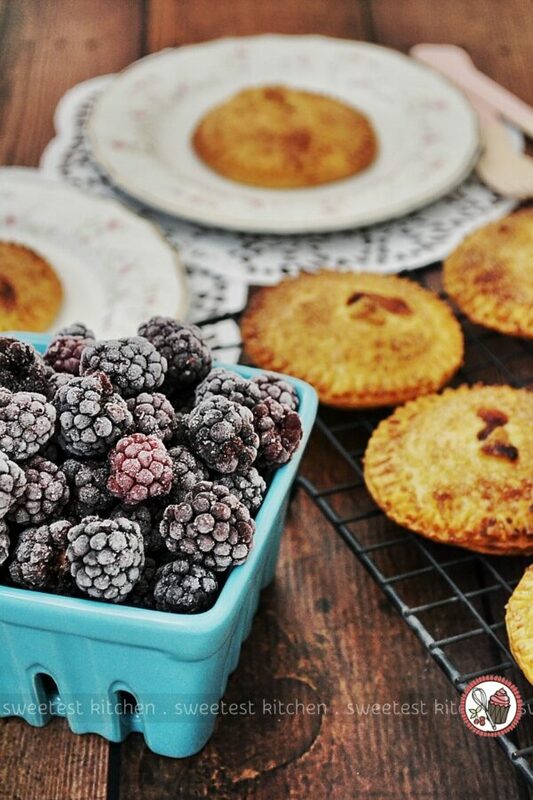 These blappleberry pies are made with blackberries and apples and are so easy to make; they're perfect for morning teas and school lunches! Mix all filling ingredients together and set aside, stirring occasionally, to bring out the juices. Meanwhile, thaw shortcrust pastry sheets and have at the ready the eggwash, a pastry brush, an 8cm round pastry cutter, a fork and a baking tray lined with baking paper. When pastry sheets are thawed, cut out as many rounds as you can (should be 27, you'll have 1 round leftover, or just cut an extra round from another sheet if you have one). On half of the rounds, brush on a light layer of egg wash. On the other half of the rounds, cut a small cross-shape into the center of each one. Note that if you use a different sized pastry cutter, baking times will vary. Smaller rounds will need less baking time; larger rounds will need more baking time. On the eggwash-coated rounds, place about 1 tablespoon of the filling, being sure to get a little bit of the juice as well. Place one of the rounds with the cross-shape on top of the filling and crimp around the edges of the pastry with the fork. Put the pies onto the prepared baking tray. Chill the pies in the refrigerator for 15-30 minutes. Combine the 2 tablespoons raw sugar and cinnamon. Preheat oven to 200C. Remove pies from the refrigerator and brush the tops of the pies lightly with the remaining eggwash. 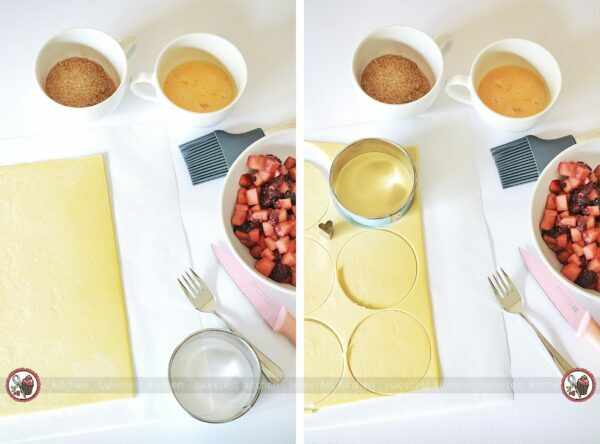 Sprinkle over the cinnamon-sugar mixture. Bake for 15-20 minutes, rotating the tray once during baking to ensure even browning. Cool on the baking tray for 10 minutes then transfer to a wire rack. Enjoy while warm (serve with ice cream if you're feeling indulgent), or store in an airtight container in the refrigerator for up to 4 days, or at room temperature for up to 24 hours. 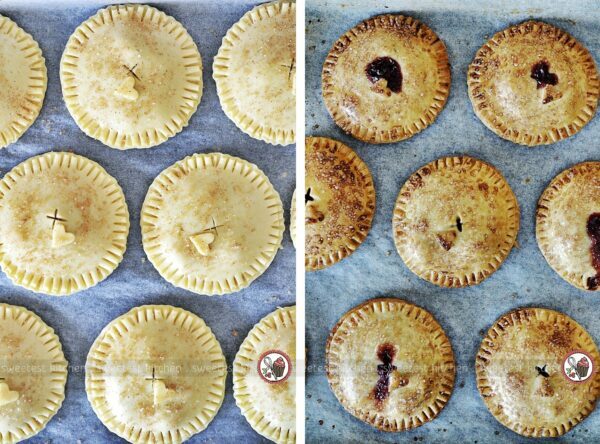 * I used CSR brand Sugars of the World unrefined sugar, which I prefer on these pies.